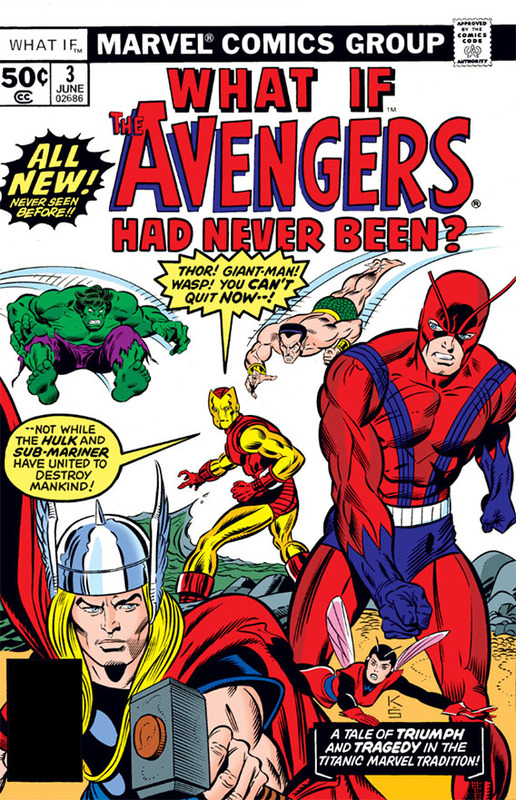 Afterward, the Avengers conduct a search for the Hulk and end up battling him, though the Hulk escapes and later agrees to join the Sub-Mariner and team up against the Avengers. 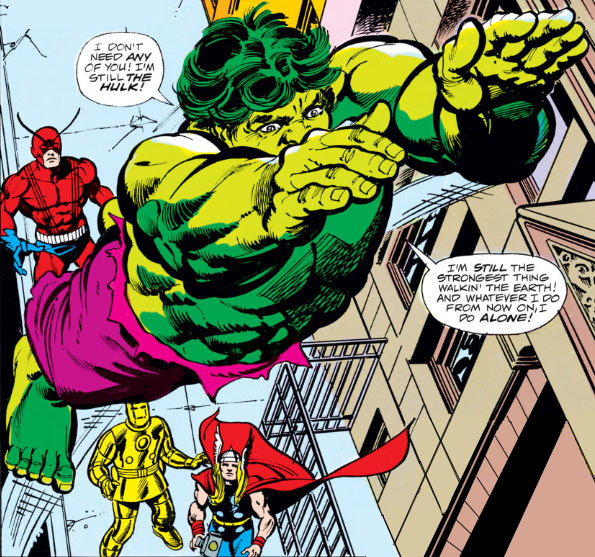 (Though it baffles me why the Hulk would want to form yet another alliance so quickly, especially given how badly the first one ended.) 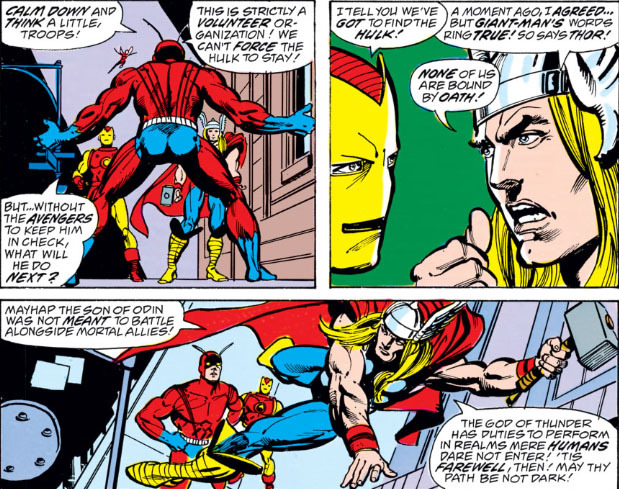 That battle ends in a technical victory for the Avengers, having driven off both Namor and the Hulk--and the team of course would go on to greater heights. 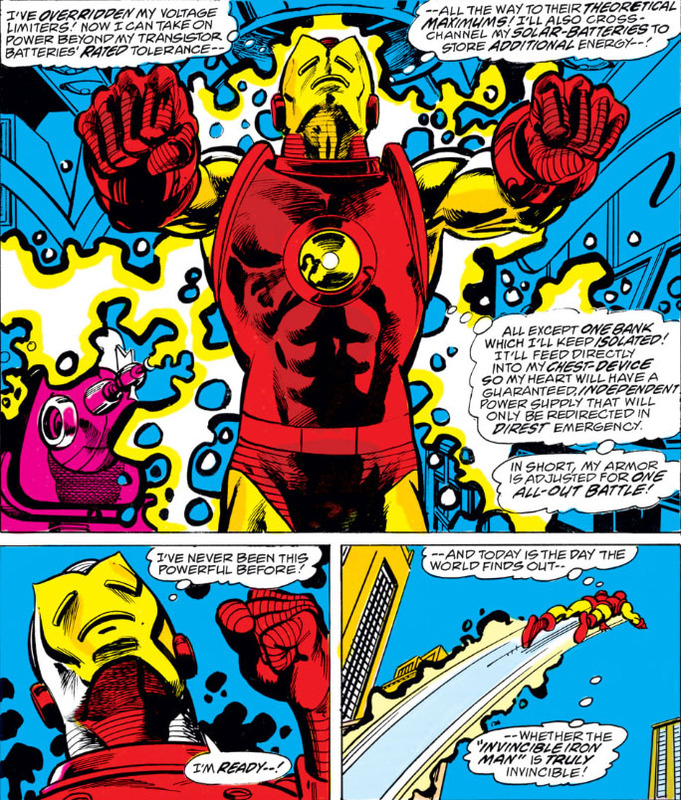 But Stark doesn't stop to think of his own experiences with becoming Iron Man--specifically, the initial difficulty of maneuvering and operating in powered armor, even for the guy who made it. 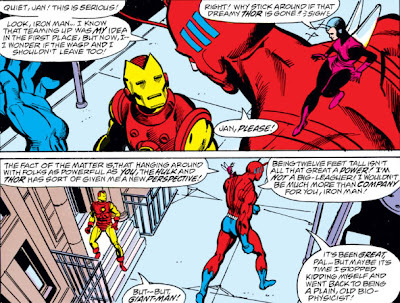 Also, being the designer and the builder, Stark isn't the most patient instructor, probably thinking that anyone should be able to step into his suits of armor and require only a small amount of time to acclimate to their usage. So it doesn't take long for tempers to flare, and for the "Avengers" to conclude that it was probably for the best that they disbanded in the first place. 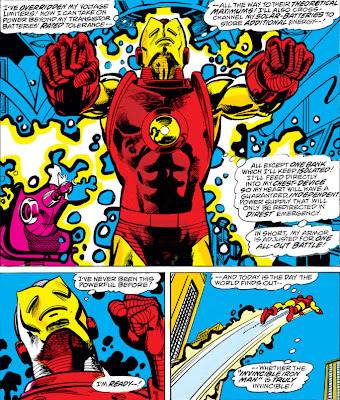 And with the beautiful pacing and wizardry of Gil Kane, you're about to see Iron Man make this fight one for the history books. and go after the Road Runner with? 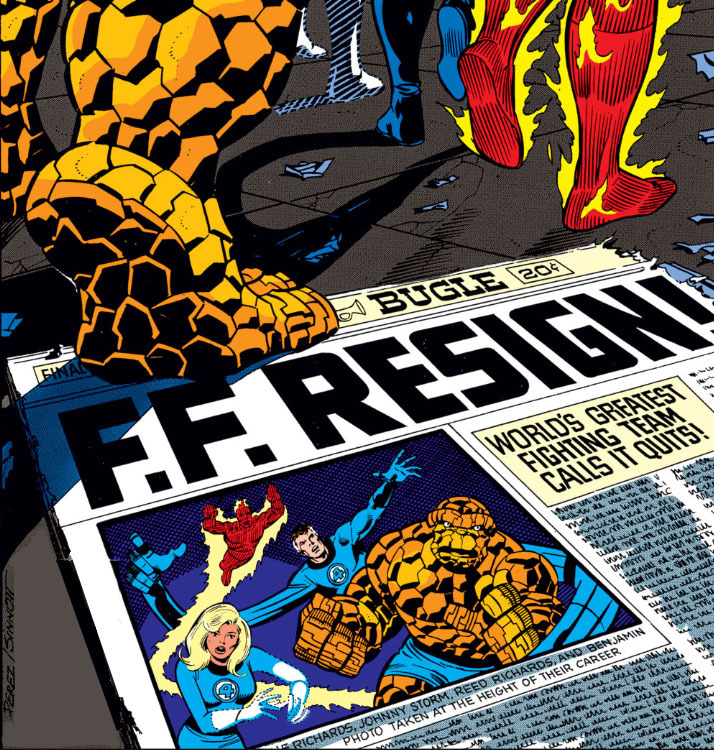 After looking at how often the Fantastic Four have called it quits during their career, I was curious to see similar stats with other Marvel mainstays. So here, in no particular order, is a brief rundown of some of their own moments of abandonment. 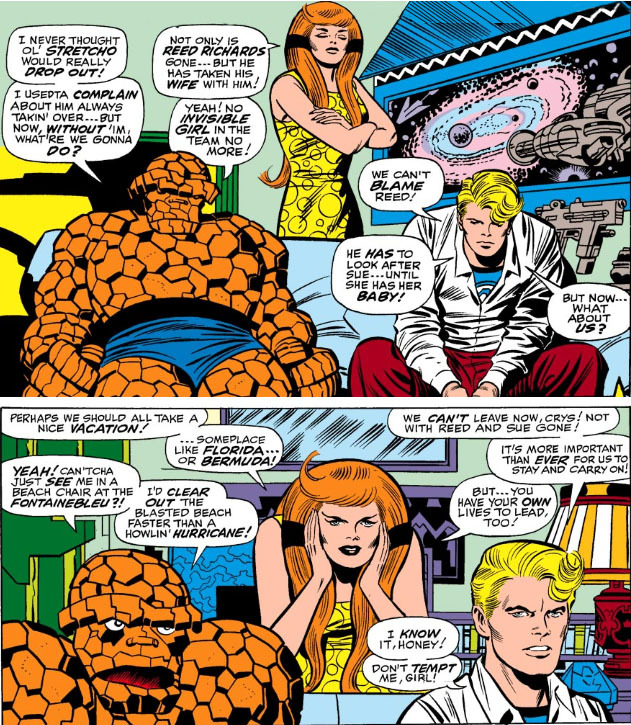 I probably won't go into as much detail as I did with the FF--seeing all of these break-ups is depressing enough, y'know? 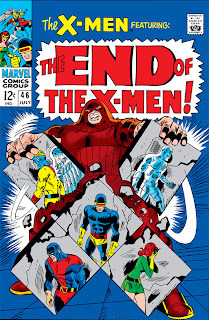 I don't know why the old team didn't just put it this way: "Well, Professor, it's been established by now that our group doesn't appeal to readers, no matter how many costume changes we go through--so before we start dragging this book down again, we're all deciding to leave at the same time, no matter how odd that appears." I guess that would have sounded too bitter. 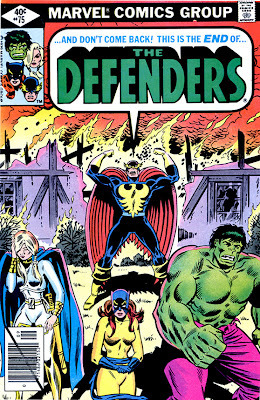 Just because his silly riding academy that the Defenders were using as their headquarters burned to the ground. 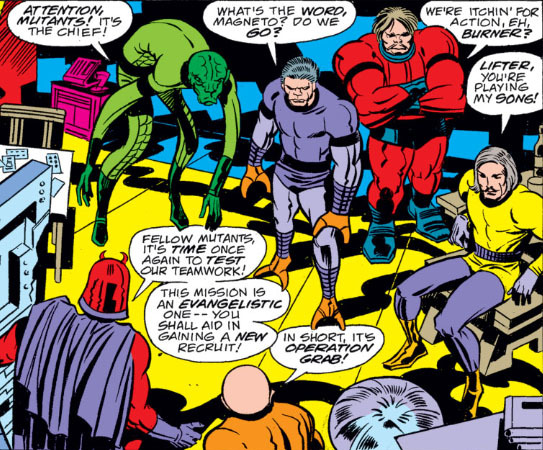 But this raises an interesting question: if you're a "non-team" and you disband, have you really disbanded? Probably not. The Avengers came within a hairsbreadth of dissolving their original team, before Hawkeye showed up on their doorstep looking to become a member--and they instead began thinking about replacements for themselves. 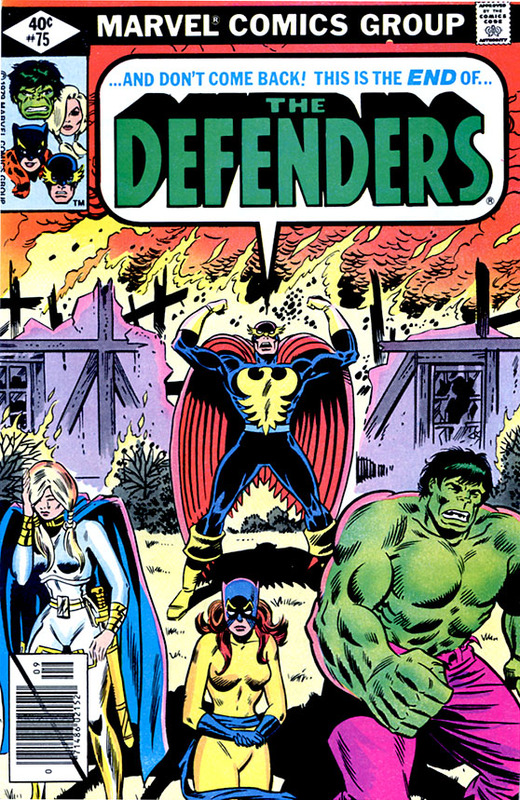 The only time I can think of when they officially disbanded (as opposed to when the Scarlet Witch ripped their lives and their headquarters to pieces and "disassembled" them) was due to a deception of the Skrulls--which the newer members fell for like a ton of bricks, but the original members had the good sense to investigate. 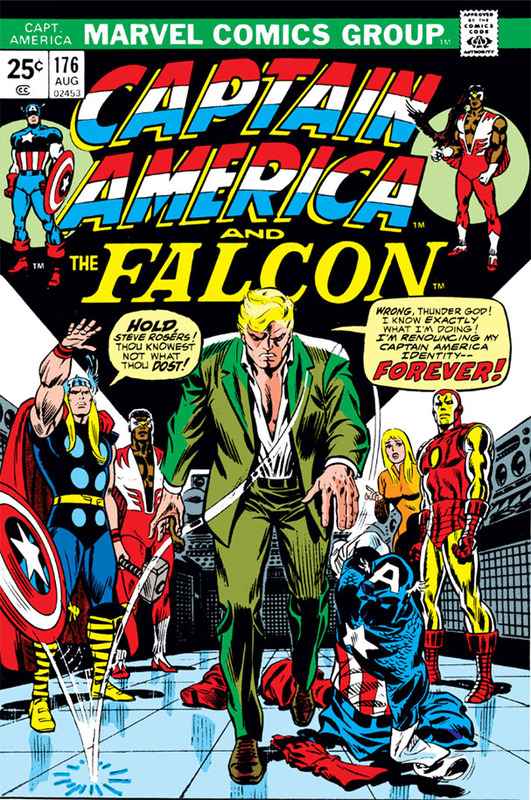 His own replacement was cruelly beaten and slain by the Red Skull, and Steve Rogers donned his stars and stripes again and reaffirmed his mission statement, leaving his "Nomad" identity behind him. And jeez, Odin sure played that card a lot. 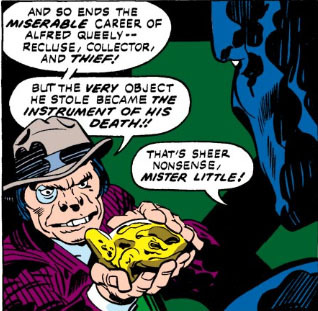 Only his Uncle Ben was the Ancient One, who granted his request to become a practicing sorcerer once again but gave him some tough love in the process. So our heroes persevere--at times becoming disillusioned again, but finding their way back to their respective identities. The comics racks would sure look a lot less colorful without them. Yes, that's the Silver Surfer you're seeing, alright--hanging onto his own board for dear life, because a bolt of flame is keeping him off-balance. 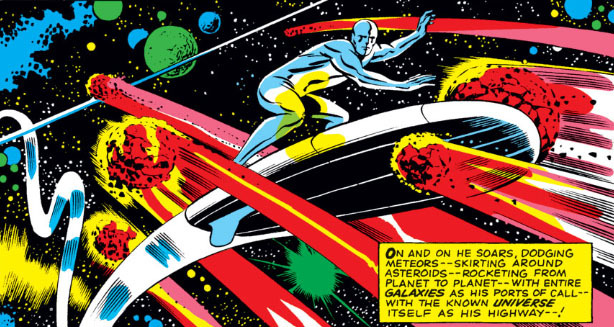 And no, your eyes aren't playing tricks on you--this is the same Silver Surfer who can remain standing while navigating meteor storms and riding the shock waves from super-novas. 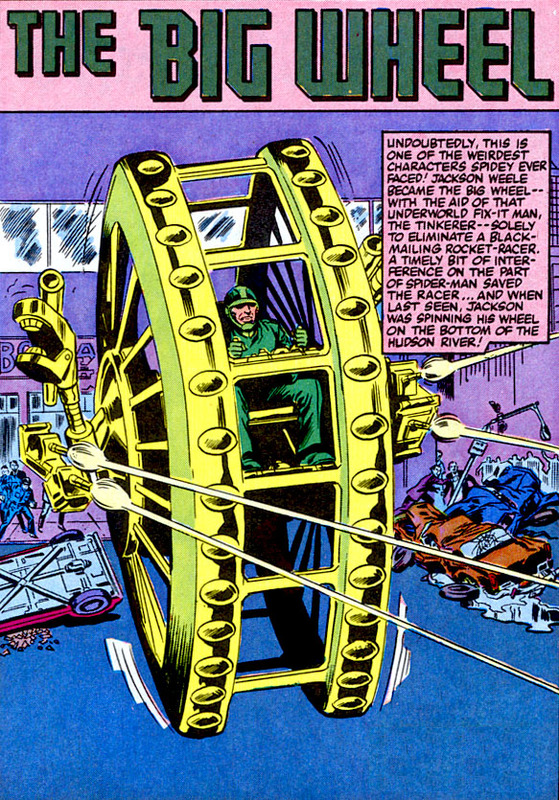 You have to hand it to a villain who delivers his captives to his hideout in an old carnival wagon. 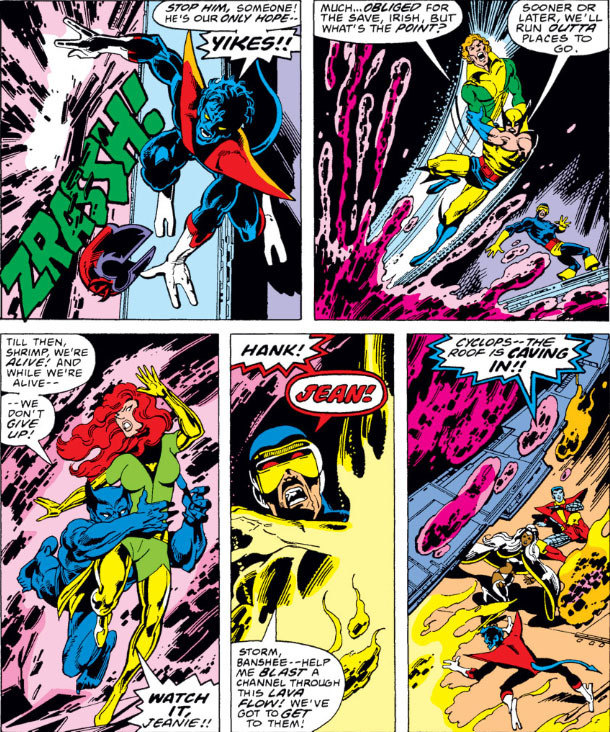 But the sequence here illustrates how Magneto descends to the base. 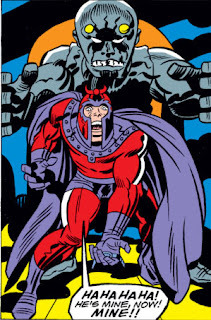 Note that it's Magneto's own power that seems to be the only way to enter or exit the base, since it's what keeps the volcano's lava at bay in order to allow safe passage. Looking over the copy that scripter Chris Claremont writes about the installation, I was noticing that he and artist John Byrne may have gotten their wires crossed on the base's schematics--it looks to me like the base draws its power from the volcano's lava, rather than Claremont's description of it being powered by the Earth's core (the former method certainly having the advantage of saving time on construction). 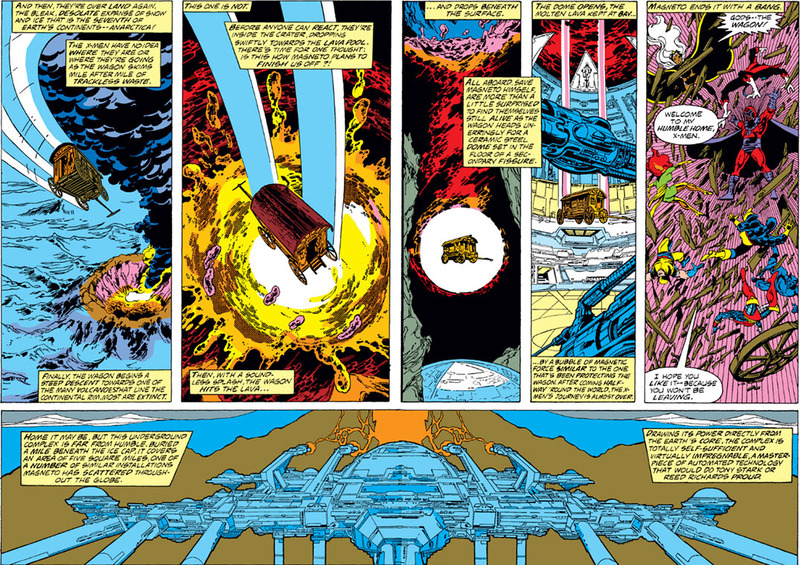 Then again, the copy says that this is only one of several similar installations that Magneto has around the world--and since I doubt the other bases have the luxury of being located underneath active volcanoes, this base may just be supplementing its power with the lava's heat. 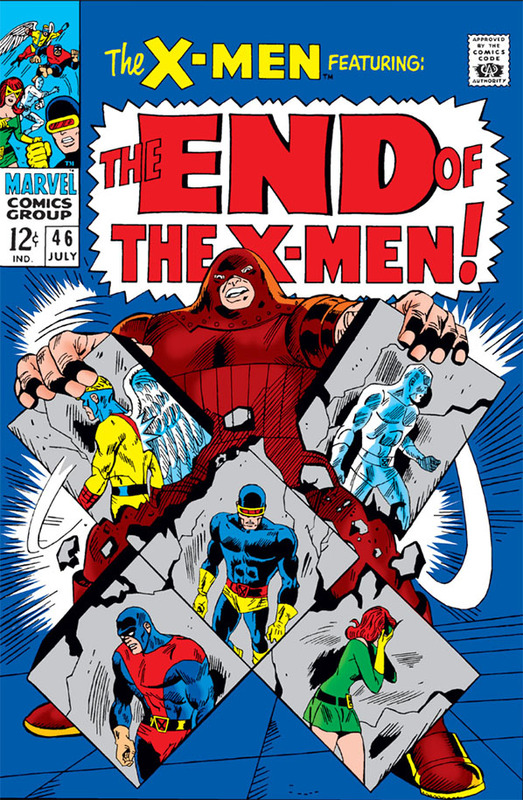 Believe it or not, the X-Men survived to lick their wounds and fight another day. Magneto probably returned to "Asteroid M," another engineering marvel which also seems to depend on his own power for entry and departure. I don't know--if you're going to pull out all the stops in designing your bases, it doesn't make much sense to roll the dice when it comes to your own safety. But we may want to wait for the memory of this base's loss to fade before suggesting that to him. 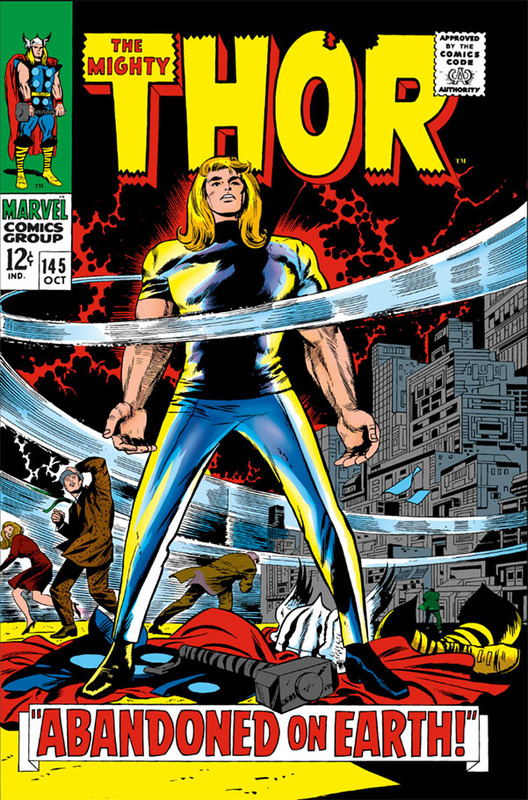 By now, we've all learned (the hard way) to roll our eyes whenever one of the comic books we read trots out a dramatic development for shock value. 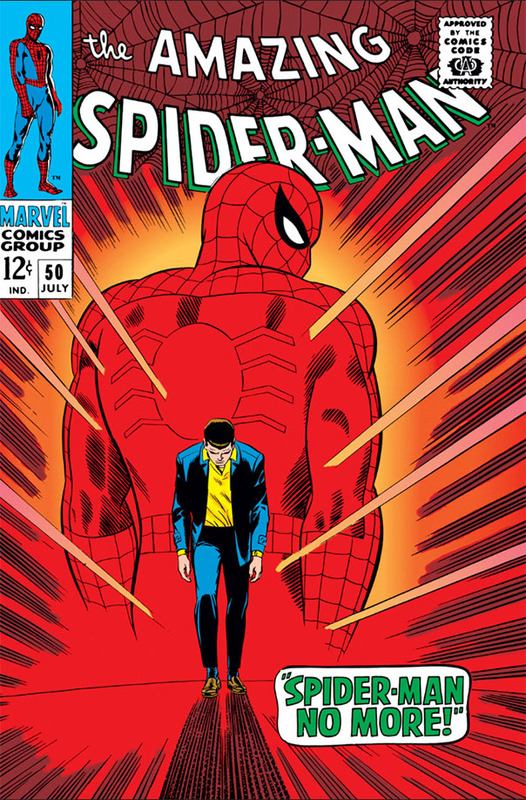 Deaths of characters don't faze us at all anymore--because if it's not a case of a character's death being just temporary, as part of some sales gimmick, then it's a case of a character whose death was "final" just being brought back through contrived circumstances. 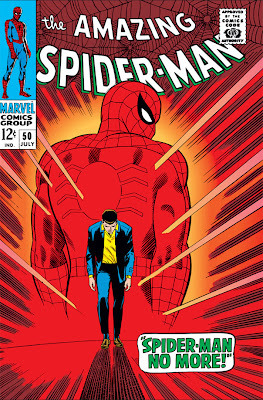 I remember in my naive days as a comics reader when I thought there actually were some deaths that didn't cross the line and were truly final. 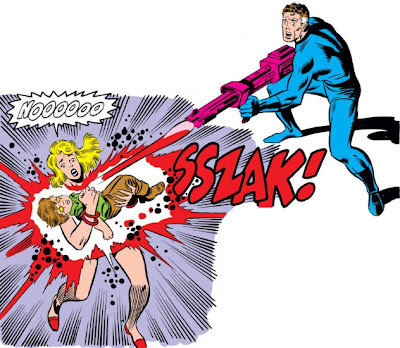 But when Bucky Barnes was brought back from the dead, Marvel gave me a hard slap of sales reality. That may have been when I mastered the Marvel eye-roll. 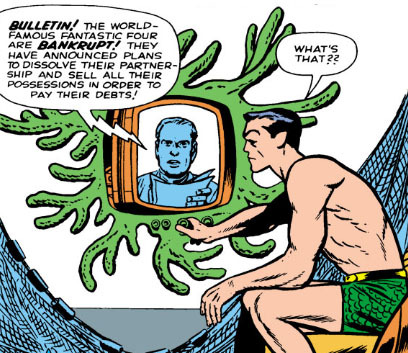 Back in the 1960s, though, these gimmicks were just getting off the ground--but it sure didn't take Marvel long to get the hang of it. 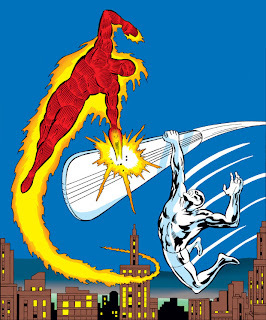 For instance, while it would be believable for a crisis at some point to lead to a break-up of either the Fantastic Four or the Avengers, did you ever think that card would be played as early as their respective 9th and 10th issues? 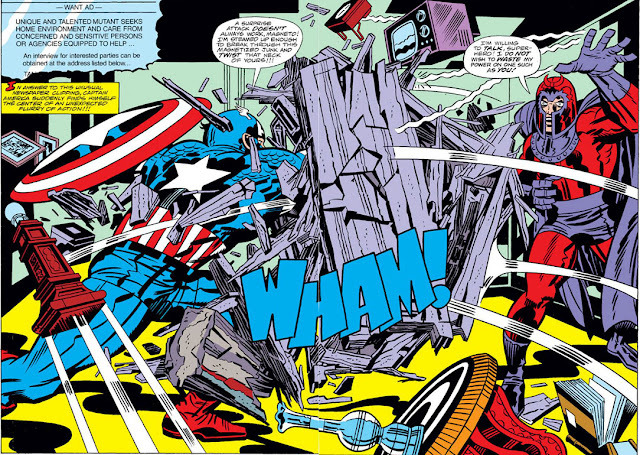 Naturally, Cap soon turned the tables and returned to help the Avengers against the Masters of Evil. 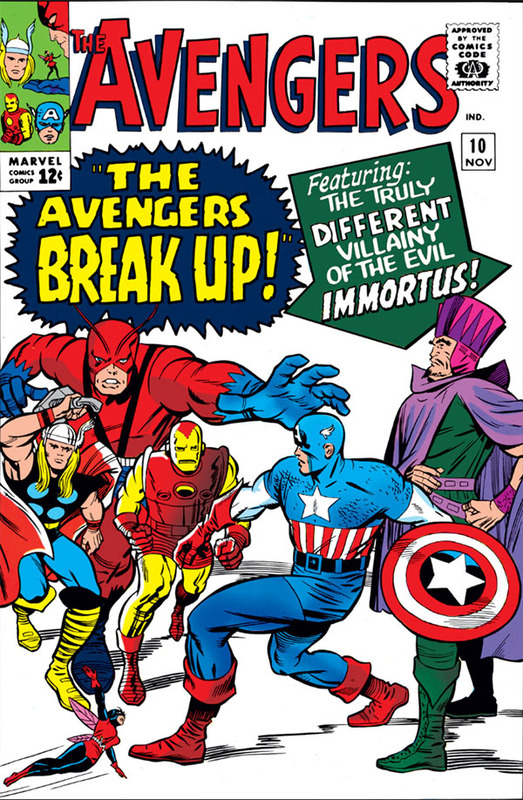 I guess the cover shocker wouldn't have been so shocking if it had just said, "The Avengers Become Separated!" 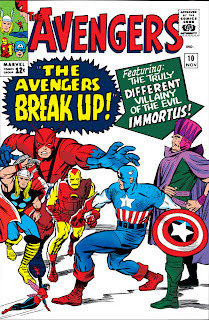 Though how about, "The Avengers Split Up! ", which is a little more on the mark? 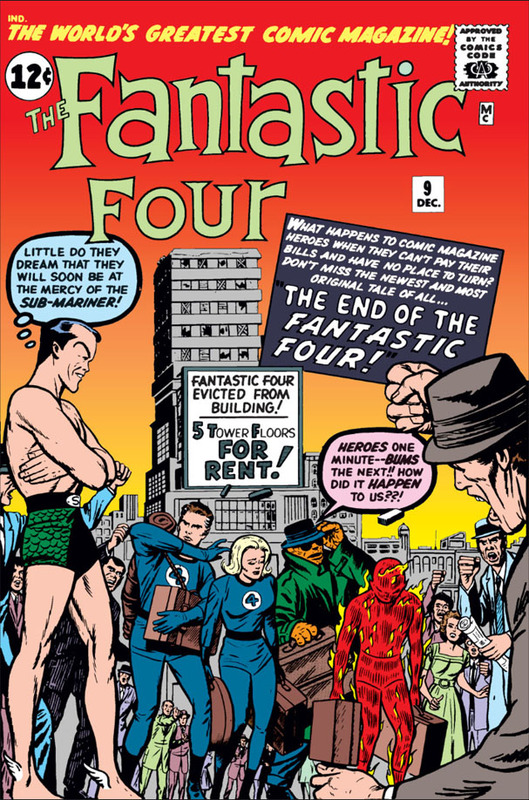 From which we can only assume that the FF aren't any good to the world without a skyscraper home or all their machinery. 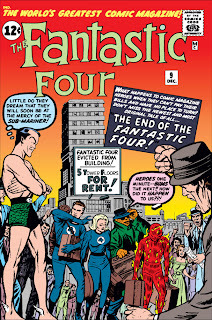 What, you can't be the Fantastic Four if you live in a duplex or something? 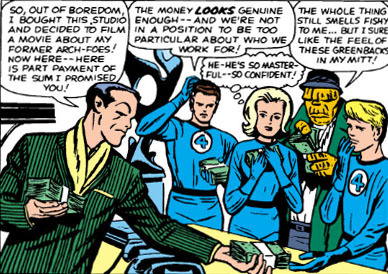 They started out in Reed's apartment, for Pete's sake. 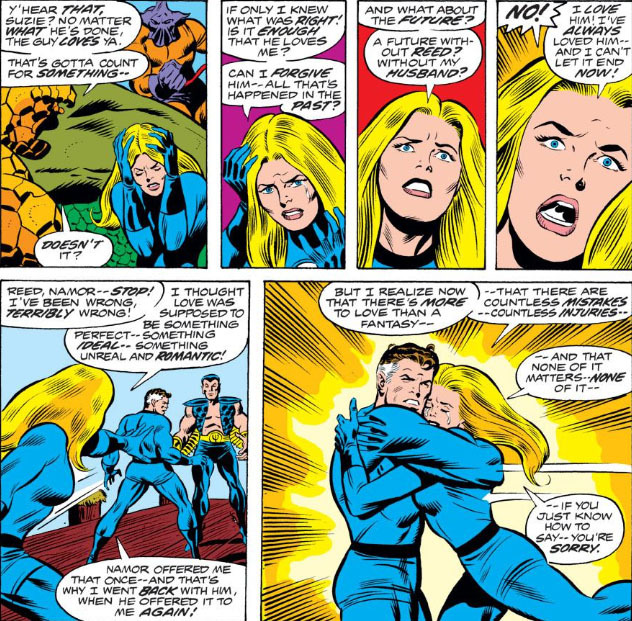 So once the crisis is dealt with, Reed is suddenly okay with his responsibilities again, and the idea as far as Sue is concerned is to keep her in seclusion during her pregnancy, with Crystal later joining the FF as her replacement. 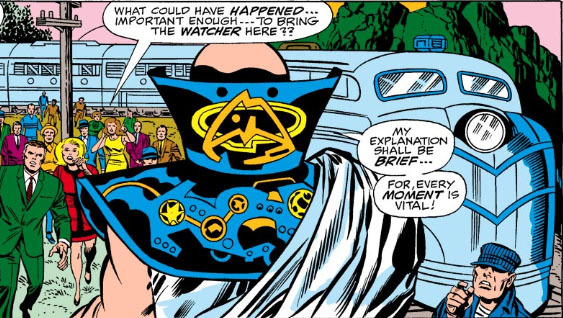 But not if Doctor Doom has anything to say about it. 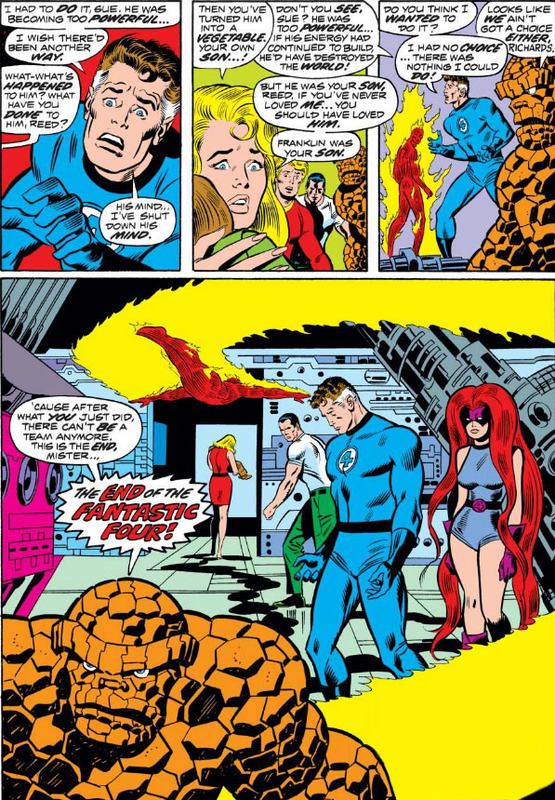 Due to an intricate plot to launch a device into orbit capable of destroying the personalities of everyone on Earth and thus making them susceptible to Doom's will, Doom gathers the members of the FF back together (with the exception of Sue), though it's never clear why. Presumably it's to get them out of the way while he puts his plan into motion--but hasn't he been doing his reading like the rest of us? 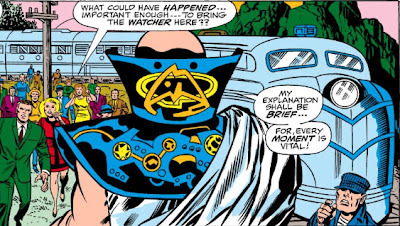 With the FF broken up, keeping an eye on Doom isn't exactly going to be anyone's top priority; for that matter, since Doom's plan involves mind control, why couldn't he just go through with it? 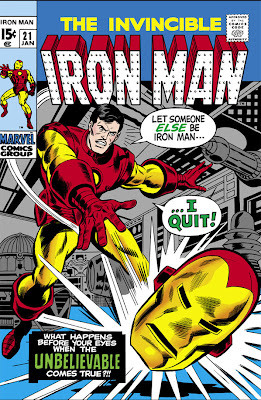 The FF would have been none the wiser. Gosh, it looks like the FF's going strong again, doesn't it? Well we can't have that. 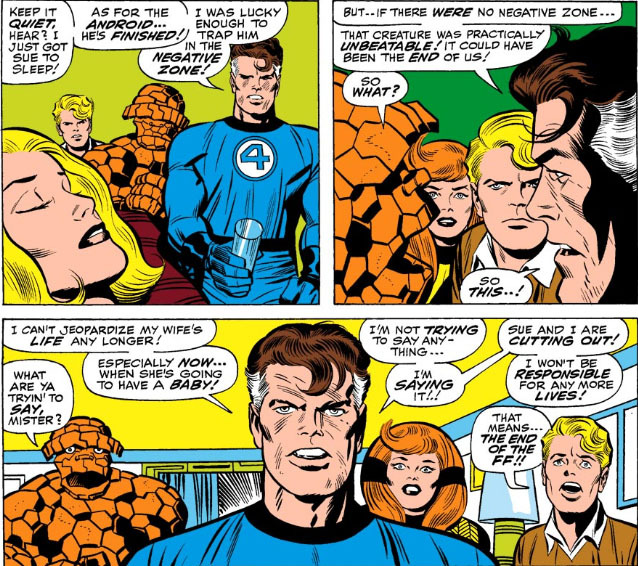 Almost forty issues later, Reed's loss of his stretching power forces him to make a decision--and by now you probably have a good idea what it's going to be, don't you? 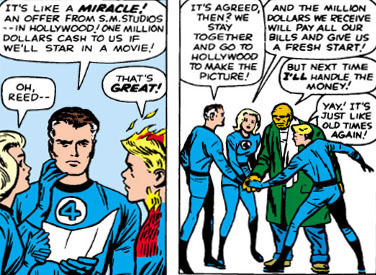 A "leave of absence" option seems like a better solution anyway, given that the FF is a corporation and a lot of time and money has been invested in sustaining it. 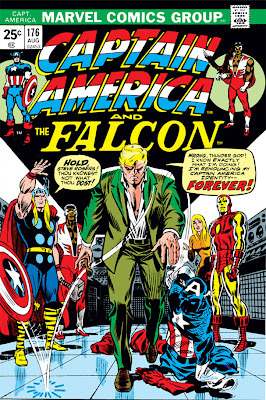 And leaves of absence have worked pretty well in the Avengers--though readers are more used to (and more comfortable with) seeing rotating team members in that organization than in the FF, and no one really wants to see the FF become the Avengers. Of course, Marvel mistook that to mean, "Hey, why don't we have some FF members become Avengers?" But stay calm. 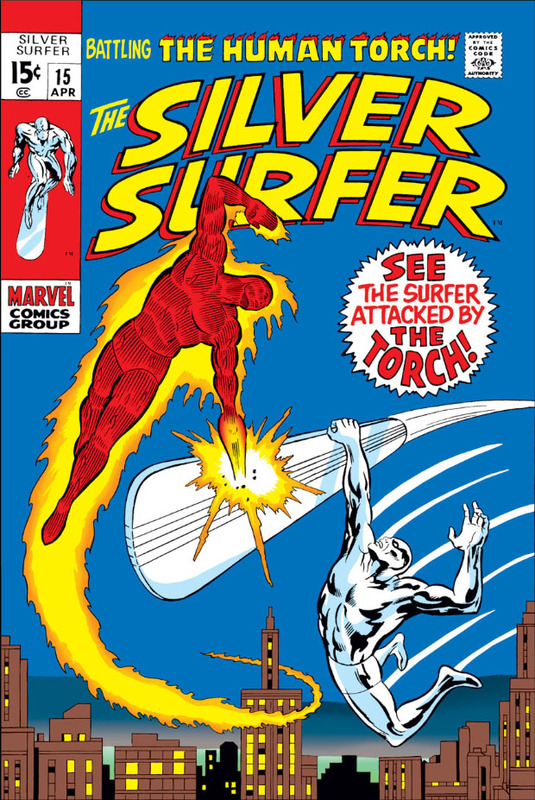 We know that sometimes Marvel has to exhaust a gimmick before coming to its senses. 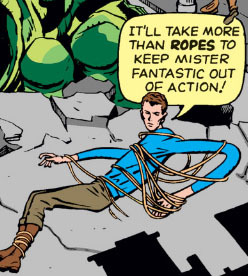 It's certainly an issue full of plot devices. Magneto's little strike squad, for instance, is just hired muscle in order to gain his prizes and provide battle sequences with Cap. 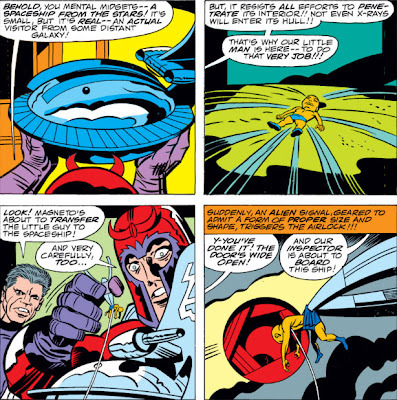 And while we know it's the secrets of the space ship which motivate Magneto, we never do learn anything more about the ship itself. Yet they all connect in some limited fashion to move the story along. 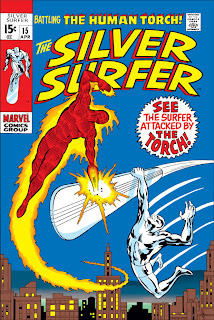 "Burner," for instance, incinerates Mister Two, which means that Mister One's moments of life are numbered--so while he's inside the alien ship, he finds the self-destruct mechanism and detonates the ship (with himself still inside it), foiling Magneto's plans (whatever the hell they are--beyond the grasp for power, we never learn anything more from him, either). 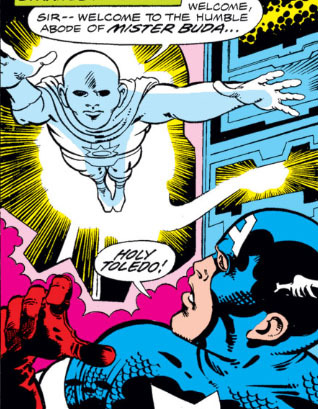 And Cap? Cap just fights his way through and around this mess, to no avail. It's a battle-heavy issue, to be sure--but it all seems so pointless. 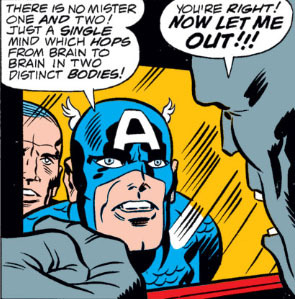 Join the club, Cap. We're wandering in a daze right there with you. Hey, mind if I give your shield a toss? 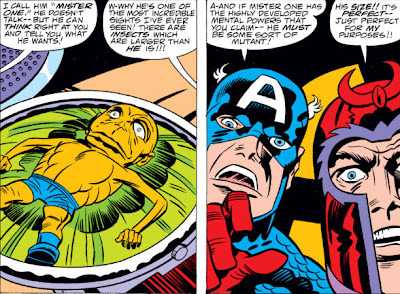 The story's ending also lets the wind out of our sails as far as the mutant it makes such an effort to focus on--the mind that shared two different-sized bodies. 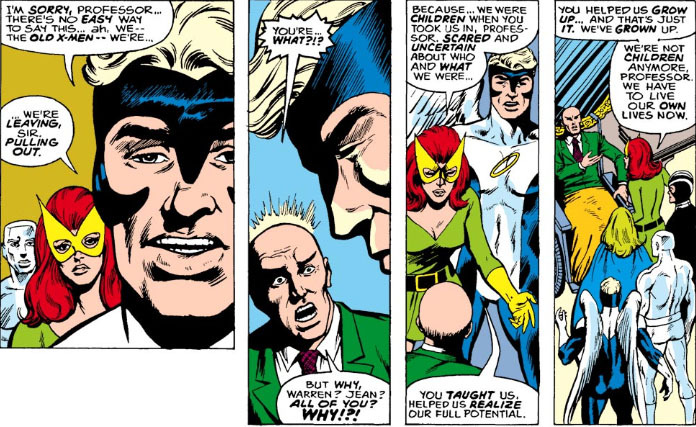 This mutant was the driving force of the entire issue, yet once it sacrificed itself no one gave it a second thought--not even Cap, who just drops the entire matter as quickly as Magneto callously did. 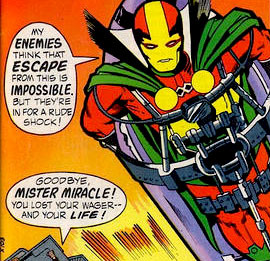 (And as quickly as Kirby himself seems to.) 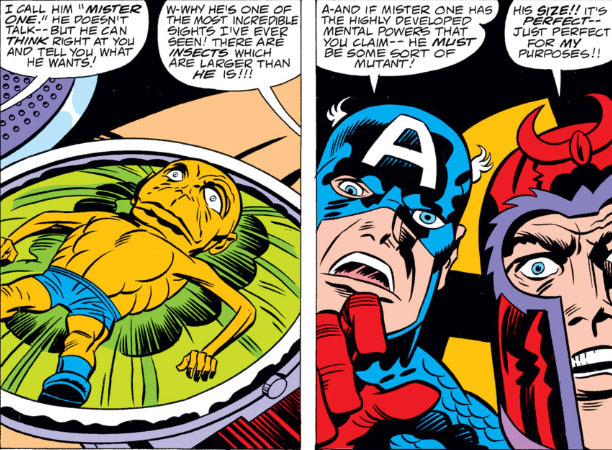 I at least felt sympathy over the mutant's circumstances as well as a little sad at his death, yet Cap just seems to be dusting his palms together in the satisfaction that the case is wrapped up. 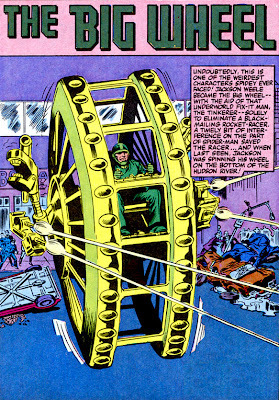 Not exactly the model Avenger. 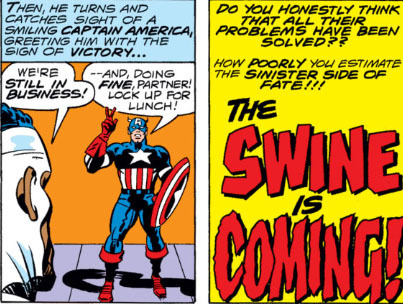 Bet you thought it was going to be "Mister" Swine, didn't you?